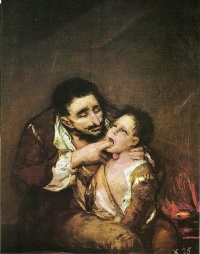 Lazarillo de Tormes is an example of the literary genre of the picaresque novel. A literary genre is a genre of literature, that is " a loose set of criteria for a category of literary composition", depending on literary technique, tone, or content. The most general genres in literature are (in chronological order) epic, tragedy, comedy, novel, and short story. They can all be in the genres prose or poetry, which shows best how loosely genres are defined. Additionally, a genre like satire, allegory or pastoral might appear in any of the above, not only as a subgenre (see below), but as a mixture of genres. Finally, they are defined by the general cultural movement of the historical period in which they were composed. Genres are often divided into subgenres. Literature, for instance, is divided into three basic kinds of literature, classic genres of Ancient Greece, poetry, drama, and prose. Poetry may then be subdivided into epic, lyric, and dramatic. Subdivisions of drama includes formost comedy and tragedy, while eg. comedy itself has subgenres, including farce, comedy of manners, burlesque, satire, and so on. However, any of these terms would be called "genre", and its possible more general terms implied. To be even more flexible, hybrid forms of different terms have been used, like a prose poem or a tragicomedy. Science fiction has many recognized subgenres; a science fiction story may be rooted in real scientific expectations as they are understood at the time of writing. A more general term, coined by Robert A. Heinlein, is "speculative fiction," an umbrella term covering all such genres that depict alternate realities. Even fiction that depicts innovations ruled out by current scientific theory, such as stories about or based on faster-than-light travel, are still science fiction, because science is a main subject in the piece of art. Dramatic poetry, for instance, might include comedy, tragedy, melodrama, and mixtures like tragicomedy. This parsing into subgenres can continue: "comedy" has its own genres, for example, including comedy of manners, sentimental comedy, burlesque comedy, and satirical comedy. Usually, the criteria used to divide up works into genres are not consistent, and may change constantly, and be subject of argument, change and challenge by both authors and critics. However, even very loose terms like fiction ("literature created from the imagination, not presented as fact, though it may be based on a true story or situation") are not applied to any fictitious literature, which is almost restricted to the use for novel, short story, and novella, but not fables, and is also usually a prose text. A subgenre may join non-contradicting criteria: Romance and mystery are marked out by their plots, and Western by its setting, which means that a work can easily be a Western romance or Western mystery. Genres may be easily be confused with literary techniques, but though only loosely defined, they are not the same, examples are parody, Frame story, constrained writing, stream of consciousness. Unless indicated otherwise, the text in this article is either based on Wikipedia article "Literary genre" or another language Wikipedia page thereof used under the terms of the GNU Free Documentation License; or on original research by Jahsonic and friends. See Art and Popular Culture's copyright notice. This page was last modified 08:29, 18 April 2014.